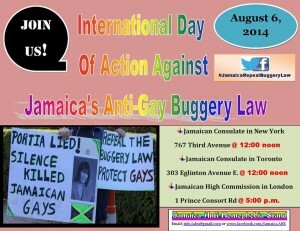 MCC is joining with human rights activists, LGBT Jamaicans, and people of faith from around the world for a day of global protest on Wednesday, 6 August 2014, in opposition to Jamaica’s Anti-Buggery Law. The law has provided legal cover for extreme anti-LGBT violence throughout the country. The anti-LGBT movement in Jamaica has been highly effective in spreading hateful propaganda about the community. MCC joins activists from around the world in calling for a coordinated, global response in solidarity with LGBT people on the ground. 6 August is Jamaica’s Independence Day, and we invite you to join us in calling for an end to violence and the legal system that enables it. Our Day of Action will send a powerful message that the British-era colonial law has no place in any modern society. Dwayne Brown, the founder of Jamaica Anti-Homophobia Stand, said, “For too long, the government of Jamaica has failed to take decisive action to address the ongoing crisis of anti-LGBT violence. One important step is immediately repealing the buggery law, which has been used in various ways to terrorize the LGBT community.” It will further support the legal challenges taking place in the Jamaican judicial system to eliminate the anti-buggery law, an effort led by MCC’s Maurice Tomlinson. Work with your church and local partners to stage a demonstration or activity, ideally at the same time as the consulate protests in Canada, USA, and UK. Virtual and in-person are equally encouraged. Follow the Protest’s Facebook page and stay update about local actions around the world.